The Get Waivered Campaign began out of Massachusetts General Hospital's (MGH's) Emergency Medicine Department (ED). In just 2 months, campaign founders increased the number of buprenorphine-waivered physicians from 2 to 38 by identifying and removing the barriers that physicians face when trying to obtain the buprenorphine waiver. MGH now has the first ED in the country to have 90% of attendings with a buprenorphine waiver. A simple, easy-to-use website—GetWaivered.com—offers four steps to break down the process of taking the training course and applying for the waiver. During a 15-minute, department-wide presentation, the Get Waivered team discussed the opioid crisis, presented potential solutions (e.g., increasing the number of waivered physicians), and introduced a group of colleagues that would soon take the waiver training. 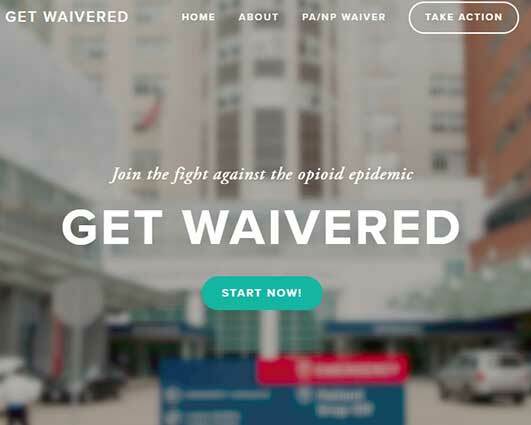 The Get Waivered website was unveiled, and a physician with an opioid use disorder (OUD) discussed his successful recovery that was aided by medications to treat OUD. Posters were hung in the department, an active Twitter page documented groups of physicians that completed training, and local media was invited to cover the story. After obtaining their waivers, physicians received pins during a special pinning ceremony to alert other providers and patients that they are trained to provide medications to treat OUD. Interested in replicating this success in your ED? Dr. Alister Martin—one of the founders—and his team are currently working with other hospitals on similar campaigns. Contact amartin24@mgh.harvard.edu for more information.